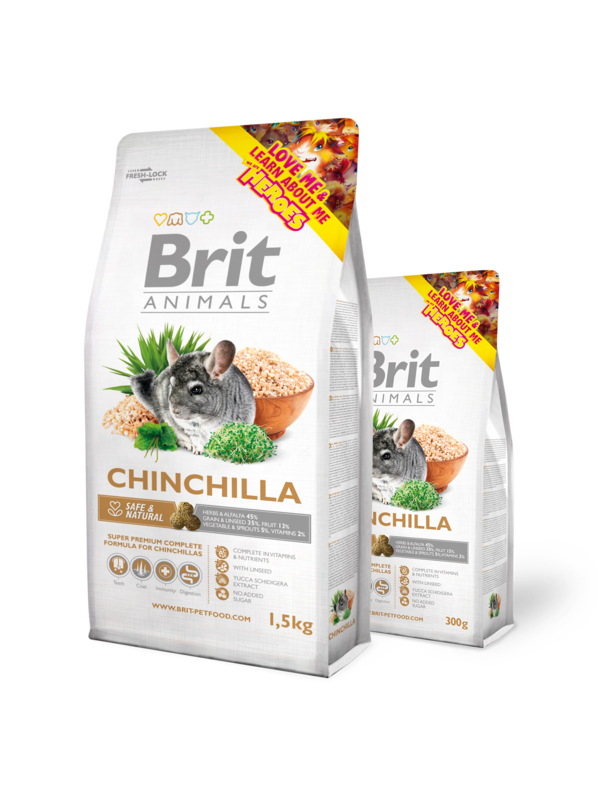 Super premium complete food for chinchillas. Safe nutrition - contains essential vitamins and nutrients. Contains linseed - a source of omega-3 unsaturated fatty acids for shiny hair contains yucca schidigera for support of metabolism & stool odour reduction. alfalfa, wheat, barley, dried apples, herbs (nettle, dandelion, plantain), wheat sprouts, rosehips, linseed, mannan-oligosaccharides (75 mg/kg), fructo-oligosaccharides (50 mg/kg), Yucca schidigera extract (45 mg/kg). crude protein 16,0 %, crude fat 3,0 %, crude fiber 16,0 %, crude ash 6,8 %, moisture 10,0 %, calcium 0,7 %, phosphorus 0,4 %, sodium 0,05 %.